We’re all waiting for Google to release its native Google Maps application, but in the meantime we can still get where we want to go with the web app for iPhone and iPad. 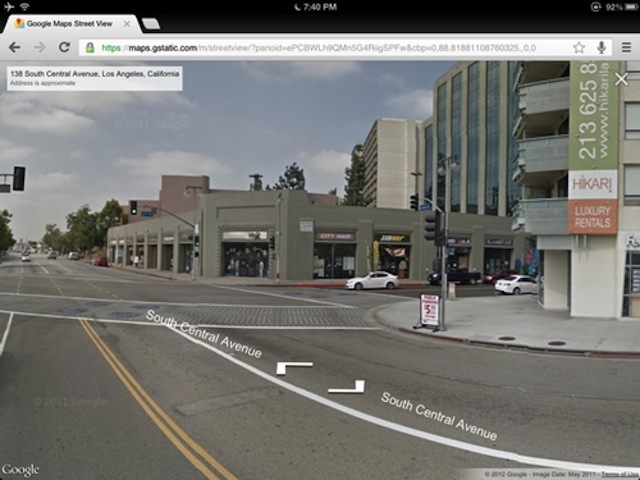 And, true to their word, Google has added Street View functionality to their web app, allowing iPhone 5 and iOS 6 users to see a street-level view of their route. To access Street View in the web app there is an icon added to the toolbar at the bottom of the page. Clicking that button will bring up a new tab in your iOS browser, showing a Street View of your search. You can navigate around using the usual arrow buttons. You’ll see floating street names and other details and you can return to the regular map by closing the tab. The Google web app is definitely a good alternative, especially now with Street View, while we’re waiting for Apple’s Maps to come up to the level we all expected or for Google to release its own app. For those that may not know, Apple dropped Google as a preinstalled maps application in iOS 6 for their own native app. When it finally launched, though, it definitely wasn’t what we expected from Apple and even resulted in an apology from CEO Tim Cook.